I finished up two more ATCs last night for the upcoming EAC ATC Swap. These ones have a bit of a story behind them. My friends in High River mostly lost all their Christmas decorations in the flood because it seems that everyone tends to keep them in their basements. So my Christmas gifts to them this year were crazy quilt Christmas items. I used a round robin block with a Christmas theme as an insert in the top of a photo box for my dear friend Eileen and forgot to take a photo of it to share. Anyway, there were scraps left over so I finished them up as ATCs and they came out really nicely and not a stitch of the original block was wasted this way. I finished these ones up in a slightly different way and it worked very well so I'll share my method. . After stitching the front and back of the ATC together, I stitched gold trim around the edge slightly overlapping the edge of the ATC. I sewed the same trim to the back in the same method making sure to line them up. Then I whip stitched the two outside edges of the trim together all the way around. It worked wonderfully and solved my usual problem of being unable to seem to finish the edges neatly. Merry Christmas to everyone! I am knee deep in a turkey that doesn't want to thaw, gifts that still need wrapping, a tree that keeps wanting to fall down and a dwindling supply of Christmas cookies. It must be almost the big day! I wanted to take a minute though to wish you all the best of the Christmas Season as well as the very best of everything in the New Year. 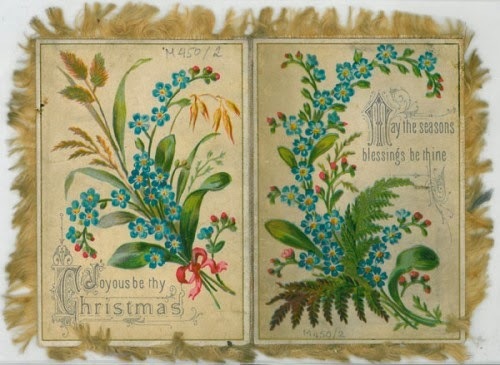 As a small gift to you, I have searched the web for public domain Victorian Christmas images that I think would make wonderful additions to some crazy quilting - enjoy! I hope you enjoy these scraps. 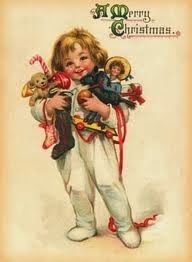 You can find many more by googling "victorian christmas images public domain". Have fun! And don't forget to get to work on those New Year Resolutions - I am! 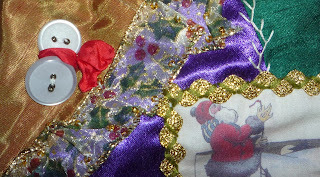 This is a stocking I made as a sample for a class I was teaching. Everyone in our family has their own Christmas Stocking rooted deep in family tradition so it has just been languishing since I made it. I have decided to give it away this Christmas to a dear friend who lost all her Christmas decorations, etc in the flood in High River. I think it will have a good home with her! I decided though I would take a couple photos before I gave it away - can't remember if I have posted about it before. It will be a private joke between my friend and I because she has a deep and enduring hatred for rick rack in all forms and I used rick rack to trim out the silkie. I love the little button snowmen too so included him in the photo here. This is my favourite seam - the little angels with their spacer bead halos. I find so many uses for these little spacer beads - can't get enough of them! I hope my friend will enjoy this stocking and now I have the fun of filling it before I give it to her! We go to Kananaskis each year for the hunt for a Christmas tree. Usually you see some kind of wildlife and this year it was a mountain sheep. We have had an unprecedented amount of snow this year here in southern Alberta and although the weather was mild at home, it got much colder in the mountains. We have a camping spot we usually go to omplete with picnic tables and firepits and while the rest go trooping through the woods in search of the tree, I build a fire and heat up hot chocolate and chili for a snack after they get back. This year the road into our little spot was gated off so we had to walk in through a kilometer of snow carrying all the gear. We soon found out that the closure was because the bridge over the creek had been swept away in last summer's floods so we had to jump from one icy rock to another to get across the creek. There saw quite a few people out there - hiking, skiiing, snowmobiling and looking for Christmas trees. The kids come although the grandkids are old enough now they can think of better ways to spend a day than getting cold for a Charlie Brown tree. It is a bit of a family tradition though so I guess we will keep going. We aren't quite ready to switch to a tree lot tree or an artificial one. So, here is my little tree, now three quarters decorated and leaning into a corner because it decided to fall over. Personally, I think I might be a little tired of this tradition! I received another gorgeous Christmas ornament in the mail, this time from the EAC (Embroiderers' Association of Canada) swap. You can't see very well in the photo but this canvaswork ornament is done on glitter congress cloth - it really sparkles. I took the closeup so you could see the stitches but here is the whole ornament complete with hanger and tassel. It was made by Eunice and I can't wait to hang it on the tree. Thank you Eunice! I have finished up the six ATCs I started the other day. If you saw them then, I had just done the star stitches in a variagated DMC - Color Variations 4126. The next step was weaving gold thread through the star stitches in variaous patterns. The two above were the first attempt. The next weaving pattern gave me this one above. Still a simple pattern but a different effect. For the fourth ATC, I combined the two weaving patterns in the first two on one ATC for a more interesting pattern. On this fifth one, I wove through the star stitches again and then added additional straight stitches using the gold thread. And then for this sixth and last one, I did a simple weaving pattern again and then used the gold thread to add additional star stitches. I have to say that these were great fun to do, seeing how weaving the gold thread through the stitches could be used to create various patterns. I can see a lot of applications for this technique and will likely be using it again on other projects. The Embroiderer`s Association of Canada (EAC) is having its last ATC swap this coming April and these are the first ones I have made for that swap. I could have cropped the photos and shown them a couple days ago but decided not to cheat - to go ahead and do the finishing first , my least favourite part! I love working on ATCs - tiny little doable, finishable pieces of stitching! They are also a great place to play with something new or to try out an effect. So, this is what I have been stitching on this week. This is just the background on them - you will have to wait a day or so to see what comes next. Using what I had in my stash, I did 2 on 18 ct aida cloth. Four more on a leftover piece of 14 count Aida, making a total of six altogether. This is far as one skein of DMC variagated floss took me so I quit then. The idea now is to weave through the stars with another thread. Hopefully I will have that done soon to show you the finished pieces. I posted recently about the online chapter of The Embroiderers' Association of Canada, EAC Virtual Threads. I mentioned that you have to be a member of EAC to join the online chapter but then thought maybe you might not be aware of the benefits of belonging to EAC! So, I'll suggest you visit the EAC blog and EAC website and look around and see. region and across Canada through chapter meetings, workshops and Seminars. 3. Access to any contests or challenges EAC is holding. 5. Access to EAC Facebook page. additional membership fee of $10 per year. 7. Qualify for EAC Awards, Scholarships, Grants and Bursaries. 8. Qualify as a course test student. 9. 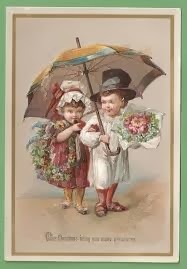 Contacts with experts in many aspects of needlework for research purposes. f. a list of links to other organizations and other snippets of information. Of course, the most important reason for joining I can think of is that it is just plain fun! I love EAC as well as my local chapter, The Calgary Guild of Needle & Fibre Arts! This is the lovely ornament I received in the EAC Virtual Threads Christmas Ornament Exchange. It was made for Yvonne and you will need to click on the photo to make it larger so you can see all the beautiful detail. I love bling and my magpie soul wants to scurry off to my nest with this sparkly snowflake! I had to dull down the colour of the photo so the detail could be seen (above) but here it is (below) in all its sparkly glory! 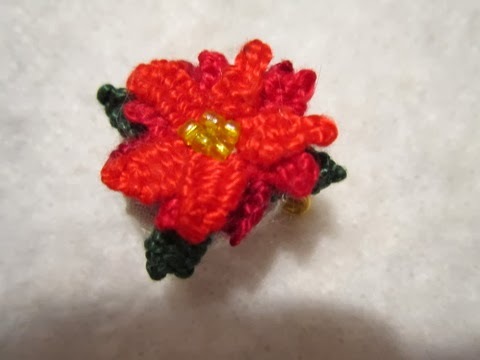 Another Christmas Ornament for Another Swap! I signed up for another ornament swap - this one in EAC Virtual Threads, the new online chapter of The Embroiderers' Association of Canada and I finished stitching it and sent it off recently. This ornament (minus a few small changes) is from this year's ornament issue of Just Cross Stitch. Of the 76 ornaments in the magazine, this was my favourite. 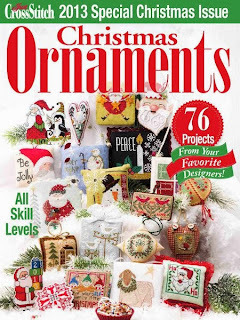 I look forward to the Christmas Ornaments issue every year and start watching for it in September. If I manage to get at least one made each year, I figure the magazine is a success for me. So, this is this year's effort, although I don't get to keep it. But I get one in return so I can't wait to share that one with you! I have been a bad blogger for months now - resolving to "get back into it" and not getting a whole lot of stitching done to show you. So, I thought I would show you what has been keeping me so busy away from the blog and the stitching! Above you will see the wonderful logo Sharon MacDonald created for the newest chapter of The Embroiderers' Association of Canada - EAC Virtual Threads! Yes, that's right, EAC has opened a new chapter online! We had been talking about it for awhile but finally took action at last year's National Seminar in Winnipeg. We formed an executive of volunteers and started taking memberships right then and there. Now, a few months later we are getting into full swing with over 90 members so far. We are set up as a Yahoo Group and you can find us at this link. Since we are a chapter of EAC, you must either already be a member of EAC to join or become a member of EAC at the same time as you become a member of the chapter. The membership dues for the chapter are only $10 a year and we are pro-rating that by when you join so we can have everyone renew at the same time in May. So, what have we been doing and what is coming in the future? - Chatting with other stitchers even when it is a blizzard like it is right now outside my house! - Ongoing "Show and Share" as we post photos of what we are working on. - Play Dates - at your own pace shared experiences with different techniques - shaving cream dying is one of the ones coming up shortly. Also dorset buttons. - Online workshops, the first of which is coming in February and March when Alison Cole will be teaching an original design just for us! So, I am finding that being a chapter president is a lot more involved than I ever knew and it has been a lot of fun but a lot of work and it has been keeping me busy. Come on out and join us if you are interested in a fun group - international members more than welcome!